its a dish from north india . First soak the vataanas for 5 to 6 hours. Take a pressure cooker put vataana, potatoes cut in four pieces, baigan cut in four pieces, green chilies, haldi, salt, kokam, water and close the lid . Let it cook for 1/2 hour in pressure cooker. After half hour open cooker mix everything with spoon. Remove it in another serving vessel. Heat oil in oil in pan and fry the onions golden brown. Garnish it wih coriander and onions. Serve hot over Aloo Patties. To make patties, dip couple of bread slices in warm water, then squeeze out excess water and place in a bowl. Add boiled potatoes and salt, then knead everything together to mix well. Form patties with the potato mixture. Then shallow fry the patties in a small amount of oil and drain on paper towels. Hi there, The recipe looks very easy and tasty. you can also sprinkle some Sev on it. and yes the green and sweet chutneys are must. hello dear, thanks for ur wonderful receipe i tried it without baigan because i dont like baigan and it turned super. Hi there, its a nice recipe but I think you forgot to mention about green and sweet and sour chutney which is also a main item in a recipe!!! Thank you and keep it up with good job. Hi, This is interesting and easy i guess. But i'm little curious to know why 1 baigan cut into 4 is required and to eb cokked in pressure cooker. 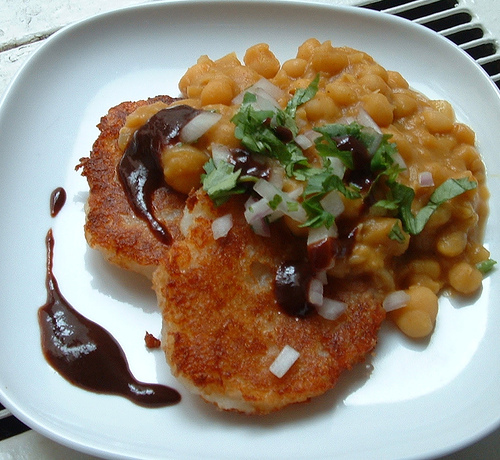 Hi, many thanks for the posted recipe Ragda pattis . Am going to try it soon or once I gather all the required ingredients. Keep posting many more nice recipes, please.